Kelly Rossebo has been directing Camp Eagle Ridge for the past 25 years! Kelly holds degrees in Organizational Communications and Child Development and has also taught middle and high school English, speech and communication. 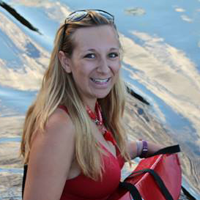 Kelly is a lifeguard, certified sailing instructor, certified food service manager and an instructor for the American Red Cross for first aid, CPR and AED certification. As part of the American Camp Association, Kelly has taught the Basic Camp Director Course for the A.C.A. and has sat on the Board of the American Camp Association – Wisconsin Section and served as the Public Relations chair. Kelly has also served as the spokesperson for the American Camp Association in Wisconsin. Kelly has appeared on Oprah, Steve Harvey and the Today Show! Kelly has also authored a book, “Lessons In Leadership” and several magazine articles on summer camp and summer camp staff and leadership training. Erik Rossebo serves as our Site and Facilities Director. Erik is constantly looking for ways to improve our program and our site. Most recently, Erik built a new dock and upgraded our waterfront area, built our slingshot range, developed a walking/running trail throughout camp and designed and built the new camp office. Currently, Erik & Kelly are working on building our new lodge and dining hall – ready to open in 2019! Erik is also a certified lifeguard and rock climbing instructor. 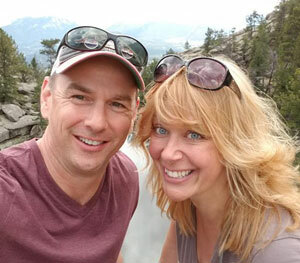 Erik and Kelly are the proud parents of four children between the ages of 18-26. This will be Kennedy’s second year on staff, serving as our Health Manager. Prior to joining our staff, Kennedy was a camper and a Counselor-In-Training. Kennedy grew up in Sacramento, California and currently lives in San Luis Obispo, California. She recently graduated from California Polytechnic State University with a degree in Biomedical Engineering. She is a licensed EMT, and she plans to get a master’s degree in Physician Assistant Studies. Ultimately, she wants to be a Physician Assistant specializing in pediatric care. While finishing school, Kennedy worked as a Care Specialist, assisting the elderly with their medication, physical therapy, ambulation, and meal preparation. She especially enjoyed being a companion to the elderly and hearing some remarkable anecdotes. Kennedy now works in the mental health field. As a scribe, she sits in on patient-doctor appointments and completes the charting and paperwork necessary to refill prescriptions. As a technician, she is a part of a provider team that treats patients with depression and anxiety. The mental health field is unpredictable, however Kennedy finds it very rewarding when she is able to be a part of a patient’s journey of recovery. Specifically as a technician, Kennedy is able to get to know her patients, console them in times of need, and witness their progression throughout treatment. When she is not working, Kennedy loves to do yoga, cook, and spend time with her family. She is also very passionate about exploring new cultures and places. She recently had the opportunity to study abroad in the south of France, where she volunteered to help teach English to elementary school children. She lived in a small town, which allowed her to converse with many locals and practice her French. She enjoys learning foreign languages, and hopes to learn Spanish as well. Kennedy cannot wait to return to camp! She is very excited to reconnect with old friends and meet new ones. Dudley Williams returns to Camp Eagle Ridge for his 19th summer! He started coming to camp as a camper, was a Counselor in Training, Junior Counselor, and a Cabin Counselor before making the Kitchen his home in 2012. When Dudley isn’t at camp, he lives in Milwaukee, Wisconsin. He works at the Milwaukee Waterfront Deli downtown and hopes to one day open his own sandwich shop selling sandwiches named after and created by his friends. He is an avid sports fan and particularly enjoys playing basketball and baseball. He’s also tried his hand at stand up comedy and comedy writing. According to Dudley, it’s “impossible” to pick only one thing that he’s looking forward to this summer. He’s excited to try out new dishes and spread his love of food, go swimming, join in activities and clubs, lead weekend trips, and laugh more than ever, all with the company of both old and new friends. This will be Maddie’s 4th year on staff, but she’s been a life long camper. Outside of camp, Maddie is in her Senior yearat the University of Green Bay, Wisconsin as a Communications major. She currently works for LaForce in Green Bay as their marketing and events intern, and performs at Comedy City De Pere as an improv comedian. In her free time, Maddie enjoys settling down with a good book, creating art anywhere, from drawing to sculptures, and playing board games. Maddie teaches archery, improv, art, and lacrosse. Her favorite nights at camp are the theme nights such as: Murder Mystery and The Avengers, and the Friday night dance! She can’t wait to be back at camp to see all of the old campers and meet the new ones! Maddie can’t wait to bring all of her board games to camp and create new clubs. Maddie believes this summer will be better than ever! 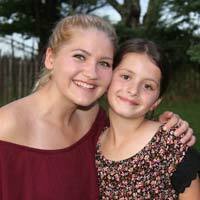 Michaela Griffin has been a camper, Counselor-In-Training, Junior counselor and Counselor. This will be her 10th summer at Camp Eagle Ridge and 3rd on staff! Michaela is from New Berlin, Wisconsin. Michaela is studying Special Education at the University of Mississippi. In the past, Michaela was very involved in the student aid program in her school’s special education room. She also coached for the special olympics swim, and track team. Michaela was a part of her high school’s varsity swim team and was voted overall team captain for her senior season. Michaela has also played soccer for over 14 years and was on her school’s varsity team along with playing club. Some of Michaela’s favorite camp activities are soccer, basketball, canoeing, kayaking and cooking. Michaela is always excited to see what each day at camp will bring for new fun memories. Her favorite trip is the Brule canoeing trip and she encourages campers to try it for the first time or go on it again because it is such a fun experience. Camp has been an important and positive impact on her life and she can’t wait to make camp a home away from home for new and old campers. Hayden Goldspink is from Glenview, Illinois. He is very excited to return to camp and this will be his 8th year at Camp Eagle Ridge. Hayden was both a Counselor-in-Training, Junior Counselor prior to joining our staff. Hayden is currently studying at University of Illinois at Urbana-Champaign and pursuing courses in secondary education centered around Biology. While at university, he has joined the men’s rugby club (fulfilling a lifelong dream) as well as being socially and academically active with the Phi Kappa Tau Fraternity Zeta Chapter. Additionally, he has been doing TaeKwonDo for 15 years and holds the rank of third degree black belt. Hayden is an instructor at his Martial Arts school and is also a yellow belt in Brazilian Jiu-Jitsu. Hayden qualified for Junior Olympics in TaeKwonDo. During high school, he was also a varsity pole vaulter as well as a competitive sprinter. Hayden took a gap year from camp last year and travelled to Rockport, Texas for 7 weeks and volunteered aiding the recovery and rebuild efforts of local communities after Hurricane Harvey. He took part in rebuilding 5 homes and aided with the completion of 3 deconstruction sites. During his last two weeks, he was put in charge of a deconstruction and mould sanitation site as well as a team of volunteers. He and his team’s work had saved the homeowner about $100,000 worth of gutting, debris removal, and black mould sanitation. Hayden loves to be active and being in the outdoors. His favorite activities at camp include rugby, kayaking, cooking, gaga, and outdoor living skills. However, Capture the Flag nights are his favorite! He hopes to bring a lot of smiles to campers and take part in making their summer as memorable as those he had as a camper. Kenzie McKowen is beyond ecstatic to be joining the 2019 counseling staff for her 12th summer at camp. Kenzie attended Camp Eagle Ridge as a camper and then became a Counselor in Training and a Junior Counselor. She is originally from New Berlin, Wisconsin and will be graduating from New Berlin Eisenhower High School. She is currently applying to colleges, where she is planning on studying Psychology and Political Science. In her free time, Kenzie enjoys singing and acting. She is currently a part of 3 different choirs and has been in the cast of 14 plays and musicals. While often seen on stage, she also works behind the scenes to help make the magic happen. She has been in the crew for 4 middle school productions. In her junior year, she student directed the musical, “Lion King Jr.” and is currently student directing, and stage managing, “Aladdin Jr.” Additionally, in high school, Kenzie has been an active member in student government, National Honors Society, and Thespian Honors Society. At camp, Kenzie’s favorite activities are canoeing, kayaking, outdoor living skills, and improv. Her favorite nights are talent and skit nights She looks forward to making many more friends (and bracelets) this summer! Adam Bloom grew up in Rhinelander, Wisconsin and will be graduating from Rhinelander High School in June of 2019. He is currently applying to colleges for Musical Theatre. Adam is ecstatic to be back for his ninth year at camp, where he has been a camper and a Counselor in Training. Adam has been an avid choir student for the past four years of high school. While participating in WSMA’s State Solo and Ensemble, he earned an Exemplary Performance award. Out of the 12,000 statewide participants, Adam was one of four vocal soloists chosen to perform at the State Music Conference in Madison. This summer Adam had the experience of being a Wisconsin Ambassador of Music, which allowed him, along with a group of other performers, to travel to and perform in seven European countries, all while enjoying the amazing European culture. Outside of school, Adam has been involved in Boy Scouting for nine years and is currently working on his rank of Eagle. Adam has also been in ten theatrical performances over the past four years with three as the lead role, including a professional college performance. This has helped open his eyes to what he would like to do for his career. He even has a knack for learning about physics when he has some spare time. Adam loves to take part in Gaga, improve, biking, and ultimate frisbee at camp and is excited to return as a member of staff this year! Rhea Mech is thrilled to be joining the 2019 staff! Rhea was a camper, Counselor-in-Training and Junior Counselor, and is returning for her 9th summer at Camp Eagle Ridge. Rhea is from Winnetka, Illinois where she will be graduating from New Trier High School. Rhea is going through the college application process right now, and she plans to major in Communications. Rhea has been an active member of her high school’s Animal Protection club for two years, where she aims to raise awareness and prevent animal cruelty, and is the club’s leader this year. Rhea is also a co-leader of the Psychology club and as well as a teaching assistant in her Outdoor Education class, where she helps instruct rock climbing, belaying, kayaking rescue procedures and much more. In her free time, Rhea loves to watch movies, write stories and hangout with friends and family. At camp, Rhea loves to play soccer, critter catch in the creek, do arts & crafts, or sit with friends and eat ice cream during free time. Aside from the activities, her favorite part about camp is the all the wonderful new people she gets to meet and learn from. Rhea is looking forward to having a great summer! Nick Baar is extremely excited to be joining 2019 staff! This will be Nick’s 9th summer at camp, having previously been a camper, Counselor-In-Training and Junior Counselor. Nick is from Hinsdale, Illinois, and will graduate from Hinsdale Central High School in the spring. He is currently applying to colleges where he plans to study Political Science. In high school, Nick has been very involved in his school’s drama department. He has participated in 11 plays and musicals throughout his high school career and was also recently given the opportunity to assistant direct this year’s fall play. In addition, Nick has also participated in a community theatre program, in which he has both performed in high-school aged shows and assisted in the production of shows for kids in elementary and middle school. Nick has also spent time volunteering at GiGi’s Playhouse, a nonprofit organization that works with individuals with Down Syndrome. He recently spent time as a member of their Junior Board as the Head of Communications. At camp, Nick’s favorite activities are sailing, canoeing, ultimate frisbee and biking. He can’t wait for great summer of meeting and getting to know all the amazing people! Cayley McKowen is so excited to be joining our 2019 staff! This will be Cayley’s 8th summer at camp and first year on staff. Cayley is from New Berlin, Wisconsin and is currently in her 2nd year at the Milwaukee School of Engineering where she is studying nursing. She spent the past summer working as a school nurse and hopes to pursue a career as an obstetric or pediatric nurse. Cayley plans to travel to Honduras this winter as part of a medical brigade where she will help provide medical, dental, vision care and medications to communities that don’t have access to healthcare facilities or professionals. Cayley was a part of her high schools’ basketball and track teams and was a member of the National Honor Society. She was a part of the state championship team back in 2016 for basketball and continues to play intramural basketball and dodgeball in her free time. While at camp, Cayley loves being active and out on the water but her favorite thing at camp is the Friday night dance! Cayley can’t wait to be back at her home away from home this summer and is super excited to get to know everyone!! 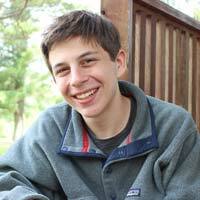 Lucas Blucher is thrilled to be a part of the 2019 staff of Camp Eagle Ridge! This will be his 5th summer at camp, he has been both a camper and a Counselor in Training. Lucas is from St. Louis, Missouri. In the fall, he will be attending Savannah College of Art and Design in Savannah, Georgia where he will study 2D Animation. Lucas recently received the Ram Pride Award at his high school. Students who receive this award are selected by faculty members for exemplifying the qualities of honesty, respect, responsibility and self-discipline. Lucas teaches Sunday School at his synagogue and is a member of the Dungeons and Dragon Club at school. In his down time, he loves to spend time with friends, listen to music, read, draw and play with his 2 dogs. Lucas enjoys traveling and before going to camp the past two summers has traveled through an exchange program to Germany, as well as spent 3 weeks in Israel on a youth group trip. Lucas loves just about everything about Camp Eagle Ridge. He’s looking forward to teaching Archery, Sailing, Canoeing, Biking and Improv. He can’t wait for another terrific summer with old and new friends! Bridget Spurr is very enthusiastic and eager to be joining the 2019 staff at Camp Eagle Ridge! Bridget is 18 years old, from Adelaide, Australia, and has recently graduated high school in November of 2018. She plans to begin at University of South Australia in 2020, studying Media and Communications, but is looking forward to travelling, and experiencing new adventures and challenges over this coming year. Bridget has been lucky enough to have previously travelled to the US with her family in 2017, where they explored the East and West coast. In 2016, Bridget joined a team of 10 other peers as a World Challenge members. They spent 4 weeks in Malaysia, including a challenging and rewarding week of working with disabled, underprivileged children at a home in Malaysia. In High School, Bridget played Clarinet in the school Concert Band, she partook in Dance Club, and also played a principal role in three drama performances. Bridget has grown up surrounded by beautiful beaches and amazing outdoor settings, where she has been immersed in outdoor adventure and water sport her entire life. Her favourite activities are camping, hiking, swimming, playing football (Aussie Rules), surfing and reading books. She can’t wait to experience new adventures, and meet new people at Camp Eagle Ridge! 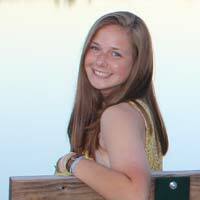 Erin Macdonald is extremely excited to be joining the 2019 staff at Camp Eagle Ridge. Erin is 20 years old, from a small town on the west coast of Scotland called Troon. Erin currently attends school at the University of Strathclyde, in Glasgow, where she is pursuing a bachelors degree in Biomedical Science. Erin will graduate from school in June 2020. Erin would love to go travelling, experiencing different cultures and embracing new adventures. Previously, Erin has visited the US three times with her family where she explored Florida, New York, Washington DC, Maryland and Virginia. In high school, Erin played field hockey where she was part of the team who competed in a league against other schools. She also enjoys dancing. Erin was part of a dancing school when she enjoyed lessons and exams in jazz, ballet, tap, modern, and musical theatre. Erin also enjoys playing the piano; she has achieved Grade 5 in piano. She also enjoys going swimming, reading books, listening to music and also playing the popular British sport Netball. At University, Erin helped found and manage the Biomedical Science society and was also a member of the Strathclyde Warriors recreational cheerleading team in 2017/2018. Erin has grown up and lived in a seaside town with lovely beaches, where she enjoys walking her dog. Erin can’t wait to immerse herself into life at camp, meet new people and enjoy the activities at Camp Eagle Ridge. Eduardo Navarro is super excited for this summer! He will be graduating from the University of Wisconsin Green Bay this fall with a degree in History and Democracy and Justice Studies. Eduardo has a passion for education and the outdoors. He has been part of three University readiness programs including AVID, Upward Bound, and Phuture Phoenix. As a tutor, summer camp residence assistant, and tutor fellow he has enjoyed helping students develop socially and academically. In his free time, Eduardo enjoys running and backpacking. He was a member of the UWGB Cross Country team for four years. His favorite race course was the NCAA Regionals Great Lakes 10K. When the weather is nice, Eduardo loves backpacking and fishing in the Door County area. His favorite place to visit is Europe State Park. Eduardo graduated from the United States Marine Corps Officer Candidate School in the summer of 2017 and is looking forward to enlisting for service after finishing his bachelors degree. Eduardo hopes to pursue a post graduate education degree one day in order to pursue his studies in Public Education. Lauren Auleciems is very excited to return for her 6th summer at Camp Eagle Ridge. Lauren was a camper for 5 years and this will be her first year on staff. Lauren plans to attend the University of Madison Wisconsin or the University of Minnesota- Twin Cities in the Fall. In her free time, Lauren enjoys running, traveling and music. Her favorite activities at camp are kayaking, sailing, and volleyball. 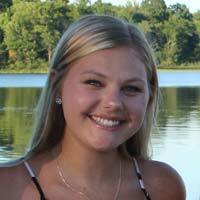 Lauren’s favorite weekend trips at camp include the Brule canoeing trip and rock climbing. This summer, Lauren is excited to meet all the new campers and capture memories that will last a lifetime as the camp photographer. Lauren is ready for an incredible summer! Will is super excited to be returning to Camp Eagle Ridge this summer! This will be his 8th summer at camp. Will attended camp for 4 years as a camper and then joined the Counselor in Training and Junior Counselor Program for another 2 years. He worked in the kitchen last summer and absolutely loved it. He can’t wait to work with Kitchen Staff again this summer and make it fantastic. Will is from Milwaukee, Wisconsin. He went to Whitefish Bay High School. He attended University of Wisconsin-Stout for Game Design and Development, but will be transferring to University of Milwaukee to pursue a career in Graphic Design, and a little mix of Culinary Arts. Will really enjoys a variety of outdoors activities such as soccer, basketball, hiking, rock climbing, kayaking and canoeing. Some of these he actually learned at camp. He also loves to draw and create things, from simple doodles to full blown pieces. He believes there are always new things to try, and to learn, and that camp is the greatest place to do all of that. He is super excited for this summer, he can’t wait to see old friends and make a ton of new ones. Anna is from Barcelona, Spain. She is studying international business at the University of Pompeu Fabra. Next year, Anna plans to also start studying nutrition and cooking techniques. Anna plans to follow that course of study with a master of marketing and advertising. This year, in addition to her college studies, Anna has been working two different companies. First, Anna worked in fashion shop and then she was part of the marketing department of a company dedicated to the sale of prosthetics to hospitals. Anna also give private classes in English, French and basic cooking to different people. In her free time, Anna loves going to the gym, playing the guitar, cooking and plays on a basketball team. Anna says shes very excited to see everyone again! At Camp Eagle Ridge, we take pride in having one of the highest staff retention rates in the nation! Most of our staff have been a part of Camp Eagle Ridge for 10 years or longer! We believe that it is the staff that works with your child that matter most.